In a world where legendary magazines such as Newsweek and The Sporting News have gone totally digital, SABR is bridging both worlds. As an organization that prides itself on maintaining the best of its past, but also constantly striving to move forward and take advantage of exciting new opportunities and technologies, SABR is now offering its members the opportunity to opt out of receiving the printed version of the Baseball Research Journal. We'll deliver the e-book version of the BRJ in the format of your choice (EPUB, MOBI/Kindle or PDF) straight to your inbox. To opt out of receiving the printed version of the Baseball Research Journal, click here to edit your membership profile. Scroll to the bottom and select "Receive publications electronically." Then save your changes. 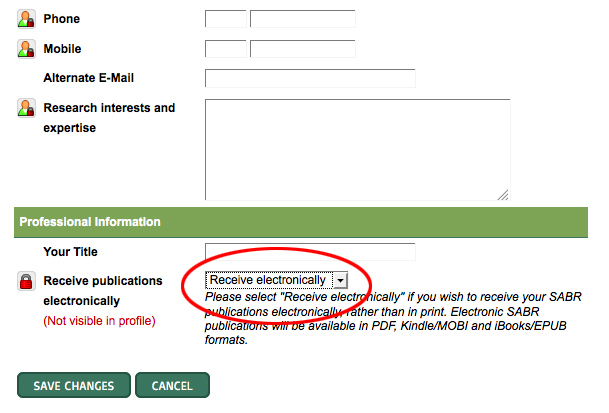 You can opt out at any time to receive all future Baseball Research Journals in e-book format. If you opt out before February 28, you'll receive both the spring and fall BRJs as an e-book. If you opt out between March 1 and October 1, your first e-book edition will be the fall Baseball Research Journal. Please note: If you do nothing, you will continue to receive two print editions of the Baseball Research Journal every year by mail. Many of our SABR members are heavy readers, who have accumulated many books and periodicals over the years. Some members, whose bookshelves are near capacity, have asked us if they could still receive our stimulating content without the burden of a hard copy. By offering this totally voluntary option of receiving only an electronic version of the BRJ, we are keeping in step with the changing marketplace for printed publications, while accommodating any members who wish to have more "portability" of the written material our members produce. Furthermore, by not printing and mailing more than 6,000 copies each month, SABR would use the money it saves through printing and mailing costs and apply it to new research opportunities; this move also helps us to be more environmentally friendly. All members also have the opportunity to download a free expanded e-book edition of The National Pastime, our annual convention journal. The print edition is being offered only as a souvenir to members attending the SABR National Convention. All SABR members can download the free e-version in PDF, Kindle or iPad/Nook format, read every TNP article online at SABR.org, or purchase a print-on-demand version at a special discounted member price. This will make it easier for members to digitally collect and save TNP publications in the years to come. By publishing larger versions of the TNP, more SABR members will have a chance to have their work published and SABR members will have the opportunity to read more top-level articles every summer. Related link: Did you know SABR members can download many free and discounted books in the SABR Digital Library? Click here to get your copy of our new e-books! This page was last updated September 20, 2018 at 5:41 pm MST.